I came across a letter in my research during my internship at the Museum. It was dated May 6, 1917, addressed to “Miss Georgia O’Keeffe,” from Kindred M. Watkins. It’s funny how, even after months of reading letters addressed to Georgia O’Keeffe, I still get excited when I see her name written in ink. Perhaps it’s because there is something mythical about O’Keeffe for me. She’s alone in my mind’s eye – alone under big clouds, alone with the big sky. But the thought of her walking into the post office, flashing a smile at the mailman, who may say something to her like, “G’morning, Georgia,” as she opens her box and is excited to see a letter with her name written in ink on the envelope – that thought makes her human to me. On one particular May morning O’Keeffe opened her mailbox and found, scribbled on scuffed up stationary from the Connell Motor Company in Amarillo, TX, a letter from Kindred M. Watkins. The letter O’Keeffe read that day was filled with an emotion bursting through the seams of its author’s limited vocabulary. Watkins tells O’Keeffe that it is “with the greatest feeling in life for you,” that he writes his letter. He tells her he is with her “right or wrong” (Alfred Stieglitz/Georgia O’Keeffe Archive). Meanwhile, in her letters to her future husband Alfred Stieglitz, O’Keeffe had picked up the habit of mistakenly referring to Watkins as “Watson” (Greenough 136). At the time, O’Keeffe was the chair and sole member of the Art Department at West Texas State Normal College, and one of the most popular and active professors at the school. 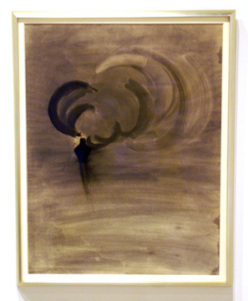 She was starting to become an established artist in New York City, having just sold her first charcoal (Train at Night in the Desert–see above) for $100. She was painting watercolors that would inform her style for her entire 60-plus year career as an artist. She was taking care of her younger sister, and beginning to be hit by the pneumonia epidemic of 1918. In short, she was busy, too busy to be the object of Watkins’ love. 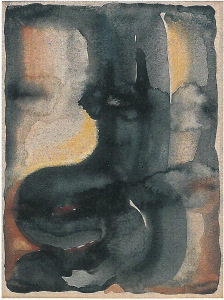 But O’Keeffe was not unaffected by Watkins’ sentiments. 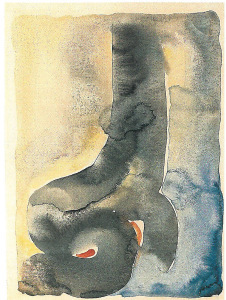 In fact, scholars now believe that a series of watercolors, titled “W.” (seen below) are abstract portraits of Watkins (Von Lintel 26). What might this information tell us about O’Keeffe’s artistic process? For me, it seems evident that we ought not look at O’Keeffe as a mythical being living among big skies, but as a human living among other humans. What is special about O’Keeffe is the brilliant, tactful way that she channeled her most human feelings into her craft: painting. Alfred Stieglitz/Georgia O’Keeffe Archive, Yale Collection of American Literature. Beinecke Rare Book and Manuscript Library. This needs a proper citation with at least a date. Greenough, Sarah. “1: All the World Greets You 1915-1918.” My Faraway One: Selected Letters of Georgia O’Keeffe and Alfred Stieglitz. Vol. 1. New Haven: Yale UP, 2011. Print. Von Lintel, Amy. ““The Little Girl of the Texas Plains:” Georgia O’Keeffe’s Panhandle Years.” Panhandle-Plains Historical Review 85 (2014): 21-56. Print. May 1, 2015 in Research Center. ← Career Night at the Museum!